The father of inspirational Pakistani activist Malala Yousafzai is the ‘he’ referred to in the title of this uplifting but confrontational documentary from Oscar-winner Davis Guggenheim (An Inconvenient Truth). Ziauddin named his daughter after a fierce female warrior who, when all hope was lost, led an army to victory; and he himself is a man who felt compelled to become a teacher in the Swat District of Pakistan, defending young girls' right to an education, even as this became a controversial and highly dangerous stance. 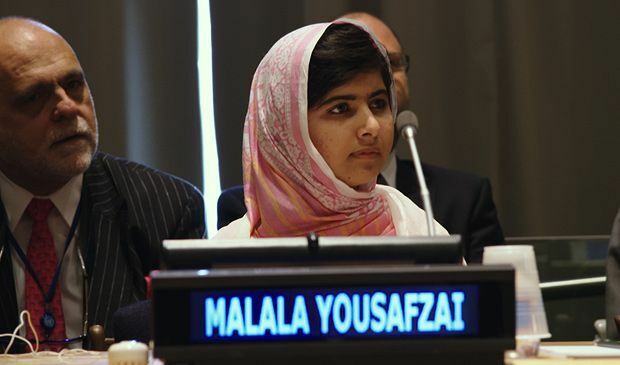 Not only does Guggenheim chronicle Malala’s journey from her near-death experience – after being shot in the head by the Taliban aged 15 – to her status as poster-child for female education, he highlights the humanity behind the activism and the beautiful bond between a father and daughter who, in Ziauddin’s own words are ‘one soul in two bodies.’ He also introduces the viewer to Malala’s mother and two brothers (the youngest of whom brings an endearing cheekiness to proceedings), who he interviews to find out more about their new life in Birmingham. And he traces the history of the Yousafzai family, with hand-drawn animation delving into both Malala and Ziauddin’s upbringings. Though Guggenheim does lose focus in the latter half of the film, with it seeming a little rushed, for the most part he produces a rousing portrait of a young woman's courageous stand. Malala and her father remain proud defenders of peaceful tactics, despite every obstacle that has been put in their way. When the camera is on Malala it’s hard not to feel inspired by her wise and unwavering spirit as she talks sincerely about the power of forgiveness and the battle against oppression. Yet we are also introduced to a teenage girl who harbours crushes on famous cricket players, as a reminder that she has many facets to her personality beyond being a role model and Nobel Peace Prize winner. General release from Fri 6 Nov.